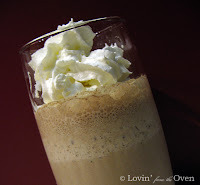 I saw this recipe on My Kitchen Cafe when I first started this blog. I vowed I would make it...and I'm so glad I did! Frozen...hot...sounds like an oxymoron, but this really works! I took my favorite hot chocolate, Stephen's Chocolate Mint Truffle and combined it with semi-sweet chocolate chips. I had some half and half on hand, so that made it extra heavenly! Since my husband and I were the only ones home, I cut the recipe in half. After gulping the last drop, I kind of wished I made a full batch! One of my goals is to try a new recipe and post it here. Thanks, Melanie! Chop chocolate into small pieces and melt in microwave on low heat. (I just used chocolate chips and melted them in the microwave on high power for 1 min., stirred, and then 30 seconds more on high power). Once melted, add hot chocolate mix and sugar, stirring constantly until thoroughly blended. Slowly add 1/2 c. milk, stirring until smooth. In blender, place remaining 1 c. of milk, chocolate mixture and ice. Blend on high speed until smooth and consistency of a frozen daiquiri. Serendipity 3 in NYC makes a Frrrozen Hot Chocolate that is the best thing since chocolate itself. The recipe is similar to the one you have here with one main difference. They use (6) 1/2 oz of your favorite chocolate - and recommend using different kinds of chocolate. Oh thank you for posting this! I love hot chocolate and frozen hot chocolate. I first had it at Serendipity in NYC and bought some of the mix - but now I can make it myself (though I may need to wait for warmer weather!). Oooh, a mint take on this would be divine. Glad you liked it! So glad to find you! Thanks for leaving the comment on my blog about your bread making recipes! I'm thrilled! Hope to read more and I've subsribed to your blog! I finally made this.I am very surprised it only calls for 2 "t" of hot chocolate powder. Wow. I put in 1 T. I may have put in a few too many ice cubes. It was almost solid at first and tasted a bit watered down...too icy. Good concept. Added chocolate syrup to our second servings and that helped the flavor balance out. Thanks for sharing!